LOS ANGELES (March 29, 2019) – Robeks recently partnered with three girls from New Milford High School in Connecticut to help them with their DECA (Distributive Education Clubs of America) presentation that they would compete with at the state level. 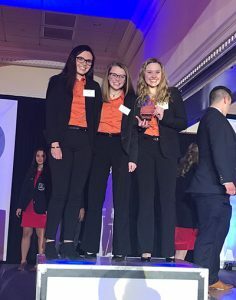 Sophie McSherry, Sarah Mickelson, and Ayden O’Neill, led by their teacher/advisor Kristie O’Neill, pulled out a first-place win with the instrumental help of Corey Remington, the Manager of Franchise Development at Robeks in Los Angeles, CA. Being big fans of Robeks and loyal customers of the brand’s amazing products, the young women decided to use Robeks as the central focus in their entrepreneurial presentation. They reached out to Remington and she connected the girls with Mark Henriques & Patrik Kovac, the owners of the Danbury, CT Robeks location, for their feedback about the franchised business. Remington also provided them with an overview of the Robeks franchise system. Together, the girls created a 20-page report and a live presentation to exhibit at their DECA competition in early March. Although up against several other competitive schools in the state, they took FIRST PLACE. Up next, the girls will be attending the DECA International Career Development Conference in Orlando Florida, from Saturday, April 27 to Tuesday, April 30 to compete nationally against schools from across the United States.